Becker Avionics is attending AERO, the leading show for General Aviation. This 4-days event is held in April 10-13, 2019 at the Friedrichshafen convention center in Germany. 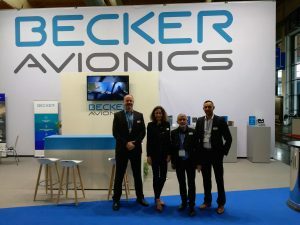 Beckers‘ team of over seven industry professionals are welcoming you, including new CEO Hans Joachim Venrath, Director of Sales and Marketing Armando Gessinger, Solutions Manager Thomas Knapp, as well as for decades experienced Customer Support Manager Gerhard Schweinfurth. The international air show is taken as an opportunity to discuss strategic partnerships in future-orientated topics such as UAVs, to showcase the company’s sophisticated products, e.g. the EASA certified BXT6553 Mode S transponder, designed specifically for full interoperability with existing TCAS II systems, all while being ADS-B compliant and to talk about tailored solutions. „After all, the customers‘ need is the real driver behind our development efforts“, states Armando Gessinger.